While sailing in a localized squall, the bowsprit cracked and broke at about half its length. Since there are wire rope stays from the bowsprit that secure the foremast, after five minutes in the rough seas the foremast cracked off three feet above the deck The wire rope stays that secure the foremast are also fixed to the mainmast, so it too broke off under the strain of the sea swells about 25 feet above the deck. Thankfully, no one was injured in the dismasting. Writing on the web site she shares with photographer T.C. “Bhodi” Sheridan, Erin Doak gave the following description of what happened: Tragedy on the Pride. On Monday at 3:45 pm, the second of two similiar squalls hit Pride II. The first had heavy rains and wind up to 45 knots that made the boat heel till the water was up to the tops of the bulwarks. We quickly struck the jib topsail, but before the sail was completely down, the squall was over. In mild conditions, we reset the sail and continued on. 10 minutes later, the second squall hit and the boat heeled again. I was standing on the starboard side of the quarter deck when I heard a loud crunch of wood and saw the bowsprit, jibboom, and all its sails go tearing off to port. I have never seen the crew rush onto deck so quickly and we all looked to the captain for orders. He called for the striking of the main and we rushed to comply, but it had just barely hit the deck before we heard the noise that sailors never wish to hear, the slow, loud crunching of a wooden mast. Looking forward and up, the foremast twisted to port and fell. Bhodi and I, along with most of the crew were still on the starboard side, and we pushed back against the rail and aft, watching as it fell along the port side of the ship. It collided with the main and the mast broke 30 feet off the deck, and came down with a crash little more than 6 feet from us. There are lots of great photos on Bhodi and Erin’s Our Pride Adventures weblog, and information about the ongoing repairs to the ship, which is currently docked in Saint Nazaire, France. Anyone who’s been dismasted remembers the experience vividly. I was aboard my father’s Columbia 52 Victoria when we were dismasted during the 1978 Santa Barbara Island Race. We were approaching the island on the evening of April 1, beating into a 25-knot wind just after dark, when a fitting at the base of the starboard shrouds failed. I was below at the chart table when it happened, and what I heard was not a slow crunch, but a tremendous bang, as Victoria’s aluminum mast snapped about nine feet off the deck. The bang was accompanied by a lurch that threw me onto the cabin sole, and I jumped up and ran up the companionway steps just in time to see the mast and sails settling into the water on the boat’s port side. There’s a real sense of shock to losing a mast; a sudden, abrupt transition to a new reality. I’ve often thought that a sailor’s education is largely a matter of learning to cope with forces beyond human control, and a dismasting represents an extreme example of that. It’s the sort of lesson that no one would choose to experience willingly, but that certainly sticks with you afterward. Dismasting-aftermath photo by T.C. 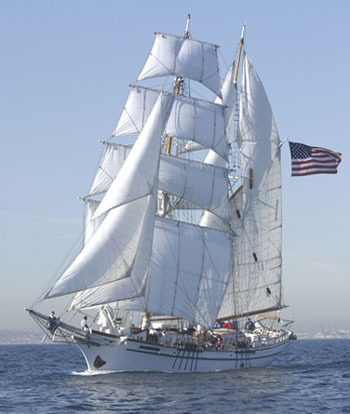 “Bhodi” Sheridan, courtesy of www.tallshipadventures.blogspot.com.